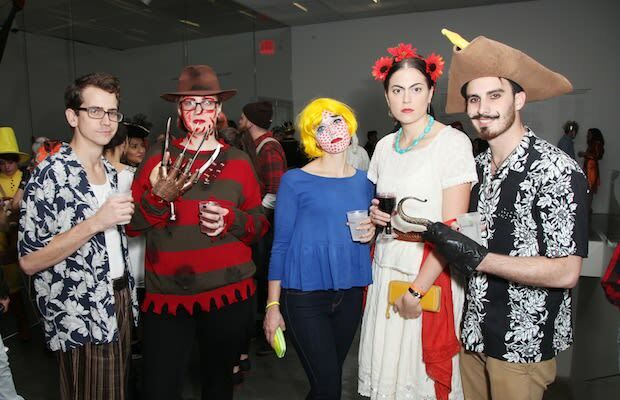 Last night was the New Museum&apos;s Annual Halloween Party presented by Bombay Sapphire and party-goers definitely brought their A game. Like any self-respecting Halloween party, guests munched on tasty food, sipped tasty drinks, danced to great music, and showed off their awesomely creative costumes inspired by films, musicians, pop culture icons, and the art world. The award for "Best Costume" went to Dominique Paul who channeled Marie Antoinette in a dress made out of photo slides (see image #2 above) and Natalia Grosner and Andrew Chisholm took the "Best Couples Costume" title as Kenny Powers and Karl Largerfeld. The New Museum was definitely the place to be, but don&apos;t worry if you missed it because there&apos;s always next year. For more photos from the night, check out the event page on PatrickMcMullan.com.